We love bringing nature into as many aspects of our lives as possible, and we knew this twist on egg decorating would appeal to other parents as well. This activity is a straightforward, DIY that you can easily do with your kids for Easter or to celebrate spring; the materials are easy to find in your art cabinet, backyard, and refrigerator. 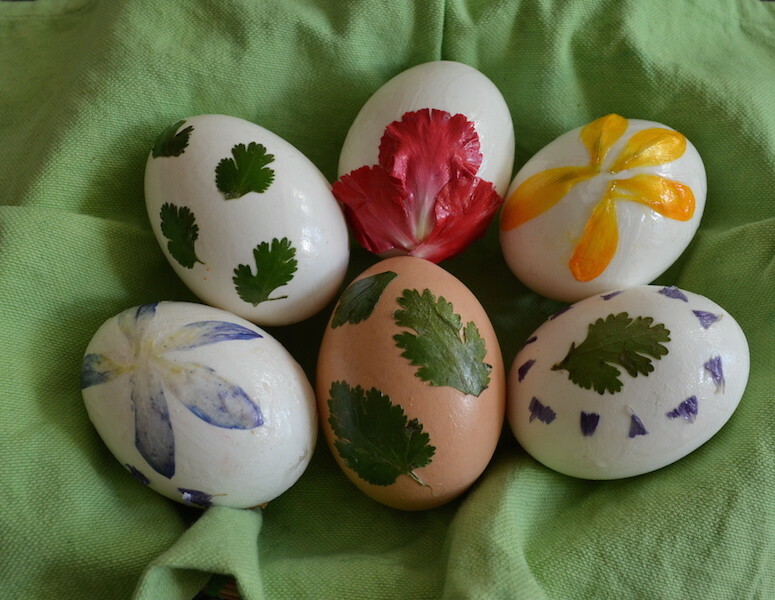 Older kids can decorate the eggs all by themselves. 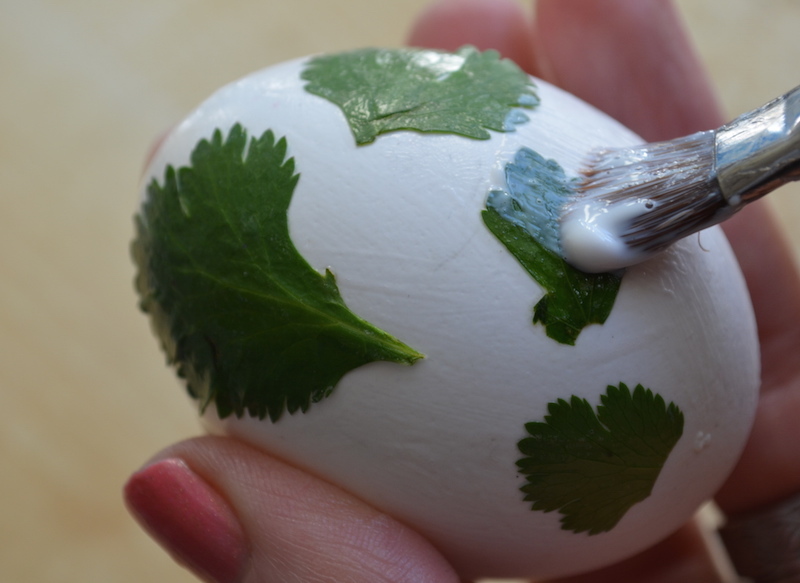 Little ones can help pick the foliage that you will be using as adornments, and they can also gently place the foliage on the eggs (which can be held by Mom or Dad). 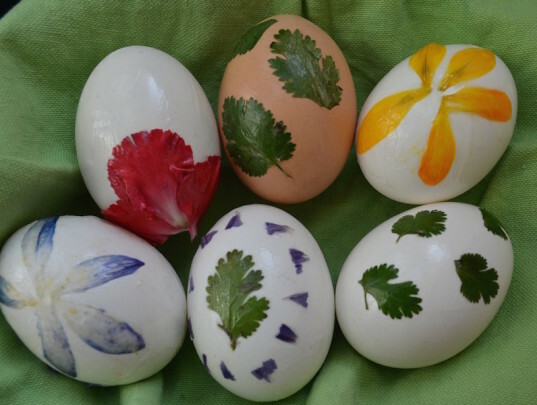 If you choose to use wooden eggs instead of hard boiled ones, you'll have a festive decoration for future years as well. Read on for a pretty, kid friendly craft that will get everyone in the mood for spring! 2. 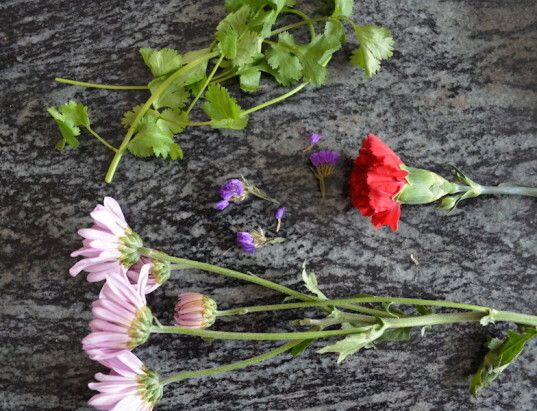 Select desired flowers and foliage. If you live somewhere that actually has flowers and other green things growing from the ground as of now (lucky you! ), you can pick the foliage from your own backyard. You can even use grass cuttings! 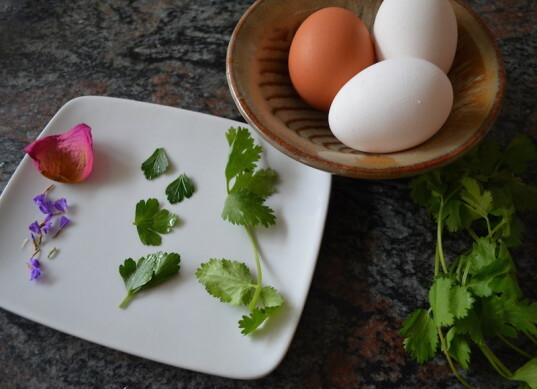 I used blossoms from a bouquet of cut flowers as well as some leftover cilantro and parsley leaves from dinner. Boil the eggs. I put my eggs in a soup pot with enough water to cover by several inches. 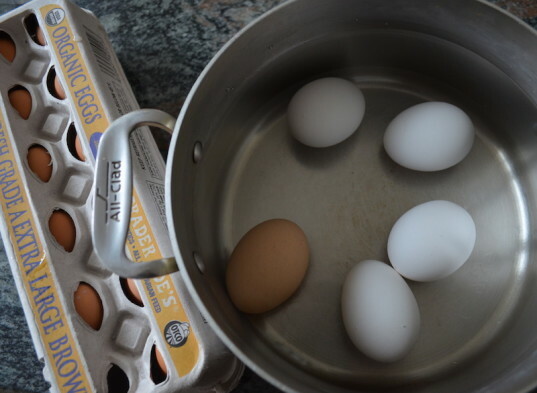 Bring the water to a rolling boil, then turn off the heat, cover, and let eggs sit for about 12-15 minutes. You won’t be eating/serving the eggs so it doesn’t matter if you overcook them slightly (as long as they don’t crack). 4. Apply Mod Podge or craft glue. Apply a layer of Mod Podge or craft glue wherever you want to add the greenery. Gently press greenery into Mod Podge and then brush on more Mod Podge to secure. Let the eggs rest until they are dry to the touch (the amount of time will depend on what type of glue you use and how much you put on). 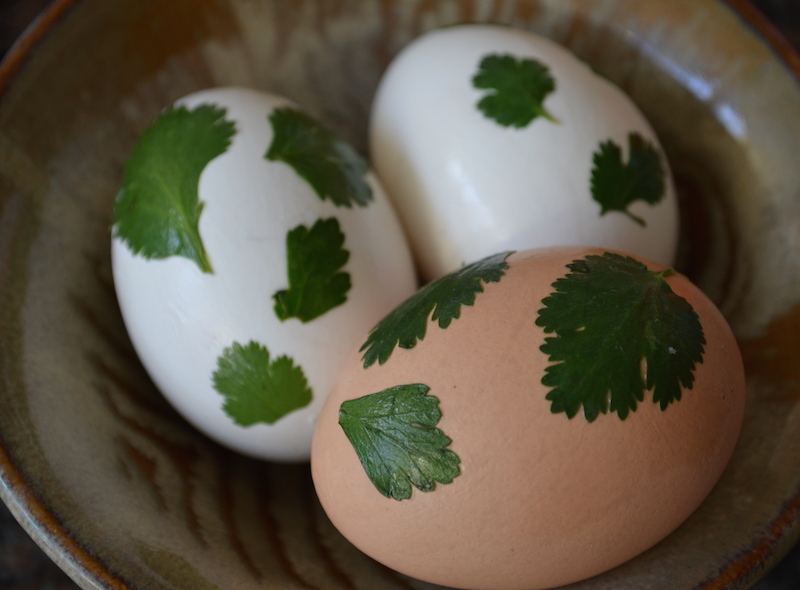 If you want to cover the entire egg, I recommend decorating one side, letting it dry, then decorating the other side (and letting that side dry). Once the eggs are dry, you can add another layer of Mod Podge to make the eggs extra-shiny, although this is not necessary. Display on your Easter table as a centerpiece or anywhere you want to bring some spring cheer! These eggs will last for a few days out on a table. You can also pop them into the refrigerator until they are ready to use, but be aware: the Mod Podge/glue may soften a bit due to exposure to moisture. Happy spring! If you live somewhere that actually has flowers and green things growing from the ground as of now (lucky you! ), you can pick the foliage from your own backyard. You can even use grass cuttings! I used blossoms from a bouquet of cut flowers as well as some leftover cilantro and parsley leaves from dinner. Boil the eggs. I put my eggs in a soup pot with enough water to cover by several inches. Bring the water to a rolling boil, then turn off the heat, cover, and let eggs sit for about 12-15 minutes. You won't be eating/serving the eggs so it doesn't matter if you overcook them slightly (as long as they don't crack).